The 23rd James Bond film "Skyfall" won the Outstanding British Film category at the 2013 BAFTA awards ceremony in London tonight. 007 took the first award of the evening and was roundly applauded by the star-studded audience. 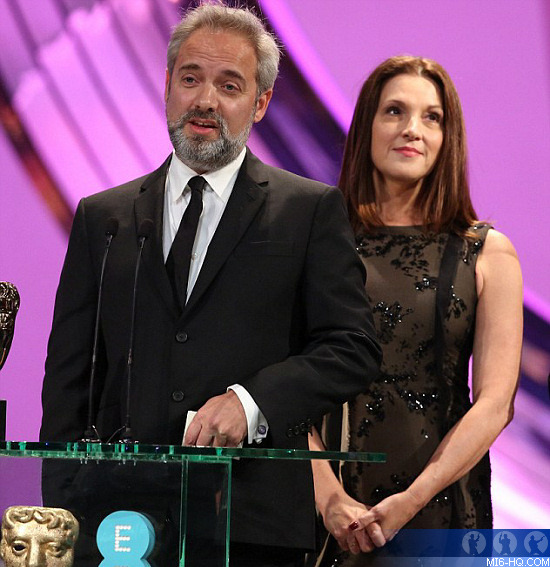 Producers Michael G. Wilson and Barbara Broccoli, director Sam Mendes and writers Neal Purvis and Robert Wade took to the stage to accept the award. After the customary thank-you's, producer Michael G Wilson noted that the film had broken the all time box office record in the UK. "Skyfall was conceived sixty years ago when Ian Fleming wrote the first James Bond novel, it was born fifty years ago when Cubby Broccoli and Harry Saltzman produced the first film and since then it's been nurtured by a whole host of directors, actors cast and crew so that today James bond is loved throughout the world. And it is on behalf of those film makers that Barbara and I accept this award. Thank you." Director Sam Mendes took the podium next with a gracious speech: "1,292 people worked on this movie and I stand here on behalf of all of them. We all had high expectations for the film and I think it's fair to say that all of them have been exceeded and this really is the icing on the cake. So thank you very much BAFTA." "There are two people want to say a special thank you to. I want to say thank you to the person whom we built this movie around, and without whom the movie could not have happened and that of course is Daniel Craig. For his brilliance, his friendship, his bravery and his sheer bloody-mindedness. And last, but by no means least, I want to say thank you to someone who's not here - the great Ian Fleming who, almost sixty years ago to the day, sat down and wrote: 'He was a secret agent and still alive thanks to his exact attention to the detail of his profession.' Here's to the next fifty years. Thank you very much." When quizzed about whether he would return to helm the next 007 outing, Mendes told reporters: "I've had a great time, it's been a huge learning curve and we would want to make a better movie next time around, and if we thought we could do that they might let me have another go again." In the back-stage interview, the producers made it quite clear that they want the "Skyfall" director back for Bond 24. Later in the night, composer Thomas Newman picked up the award for Original Music for "Skyfall". Back stage, Newman said: "You think it's just music, and I've done music before, but then there's James Bond staring at you - and you can't help but remember that."